The Columbarium in San Francisco is one of only three cemeteries within the city limits. It's the final resting place for the ashes of an estimated 30,000 people. This gorgeous neoclassical building was once the centerpiece for a larger, 27-acre cemetery. In 1929, the rest of the cemetery was moved outside the SF city limits. This building, and those buried inside, were allowed to stay. However, the building was abandoned in 1934. With no one taking care of it, it fell into disrepair. It was not taken care of again until it was taken over by the Neptune Society in 1980. They did an amazing job of cleaning it up and restoring it to its former glory. Today, it's a beautiful place to visit. The historic main building includes small cubes where thousands have been laid to rest. They include the ashes of the deceased as well as displays that show their personalities. Each one is unique and helps you get a feel for the person buried there. You will see everything from pictures with family and friends to small trinkets from vacations. Many also include small articles that tell about the person's hobbies, interests, or awards they won during their lifetime. The urns, that also hold the ashes, are very unique. You will see everything from ornate jade pieces to cookie jars. They tell you even more about the personality of the person that is laid to rest. In addition to the colorful memorials, you will be in awe of the beauty of this building. From floor to ceiling, you will find gorgeous details and several amazing stained glass windows. 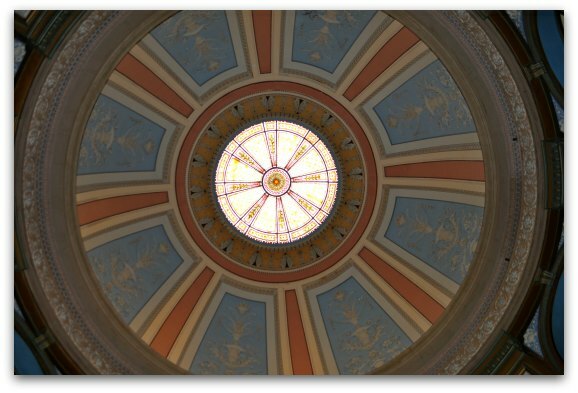 One of my favorite details is the colorful dome. Stand in the middle of the building and look up. It's simply beautiful. During your visit, you are welcome to roam around the first floor on your own for as long as you'd like. The upper floors are restricted to family and friends or those that have made an appointment in advance. 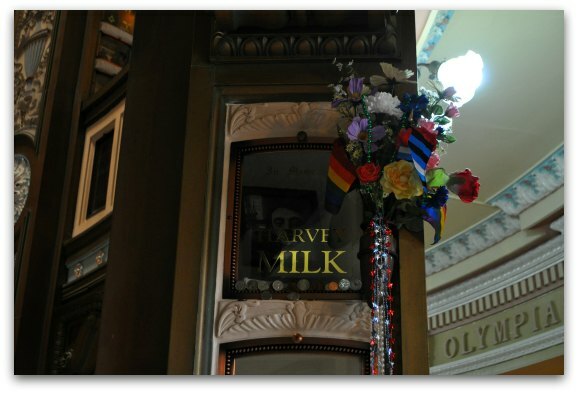 Many people believe that the Columbarium in San Francisco is the final resting place for Harvey Milk. Since his death was so tragic and there was so much controversy around it at the time, they decided to not put his ashes here as a safety measure. However, when you first enter the main building, you will see a small memorial with his name. 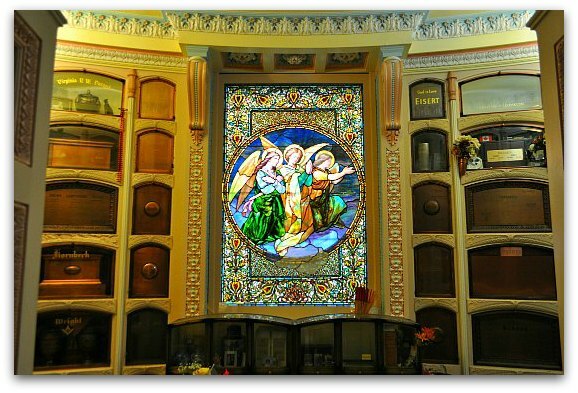 It might seem strange to visit the Columbarium in San Francisco. However, it's an amazing experience and is the perfect place for anyone that loves to head off the beaten path. Note: One thing to keep in mind during your visit is that this is an active cemetery and they do have memorials in the main building a few times a week. Be quiet when you first enter, just in case there is a memorial in process. You are still welcome to look around, but please be respectful of those mourning their loved one. While you are free to walk around on your own, you can also make an appointment for a free, guided tour by Emmitt. He has been the caretaker for the Columbarium in San Francisco for years and knows this place better than anyone. He will give you a complete history of it as well as point out some of the most interesting characters buried here. You can schedule your free individual or group tour by calling the main office at 415.221.0794 or by calling 415.771.0717. 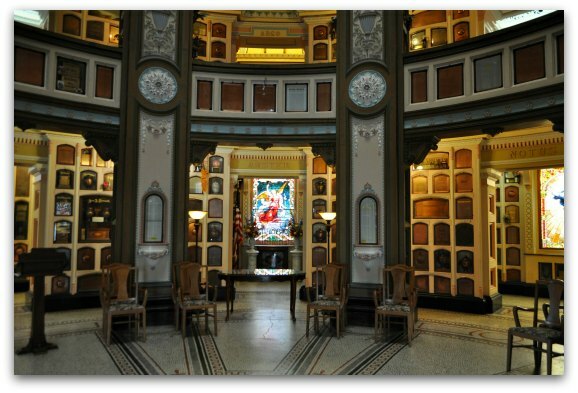 The Columbarium in San Francisco is open to the public every day of the week. They close at 3pm on Christmas Eve and New Year's Eve. They are closed on Thanksgiving, Christmas, and New Year's Day. 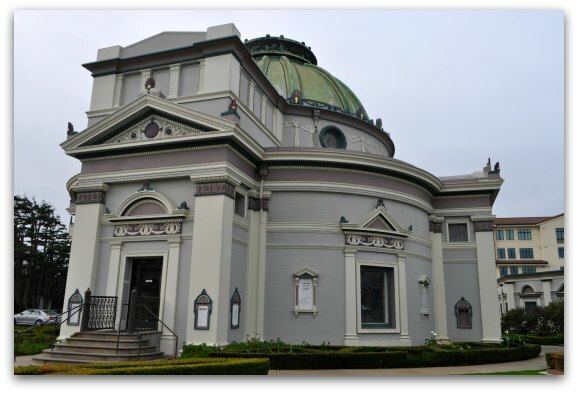 You will find the Columbarium in San Francisco at 1 Loraine Court. It's easy to reach by bus or by car. By Bus: The easiest bus to take to get here from downtown SF is the 38 Geary. Take it to the stop on Geary at Commonwealth Street. From here, cross Geary Avenue and walk south on Stanyan Street one block. Take a right on Anza and walk one block to Loraine Court. While you can see the Columbarium from the bus stop, you can only enter Loraine Court via Anza. By Car: It's also easy to get here by taking Geary Boulevard to Stanyan Street. At Stanyan, turn left and drive one block to Anza. From there, take a right and drive one block to Loraine Court. Take a right at Loraine Court. It's one block to the entrance of the Columbarium and the official parking lot. You are free to park here at no charge. City Hall: Another place that I highly recommend visiting is City Hall. While many people stop for pictures outside, you are also welcome to take a look inside. 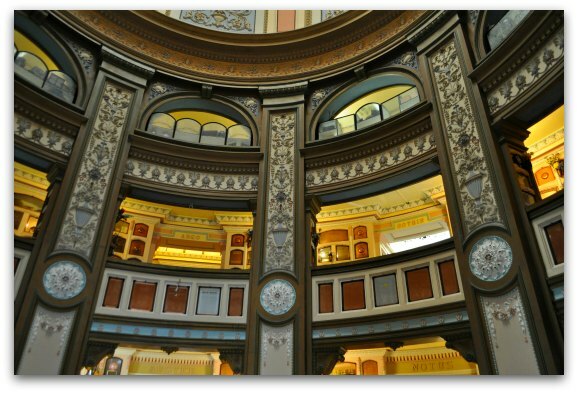 This is where you can see their gorgeous marble staircase, the inside of its famous golden dome, and a small history museum on its first floor. Click here for details. Haas Lilienthal House: Step inside a historic Victorian during your visit to the Haas Lilienthal House. A visit here includes a guided tour on its first and second floor as well as a look around it's small basement museum. Click here for pictures and additional details on visiting. Diego Rivera Frescos: In San Francisco, you will find three Diego Rivera Frescos. All three are within buildings that offer free visits to the public. My favorite is the large multi-panel fresco on the main campus of City College. Click here to find out where all of them are located and what you need to do in order to see them. Savings Tip: Are you looking for a way to save a little money on your visit? If so, then check out the great selection of discounted tickets on Goldstar. They offer tickets at up to 50% off tours, theater performances, cruises, comedy shows, and more. Click here to see their current selection and start saving today! All Hidden Gems: SF is full of other fun hidden gems. They range from the antique arcade games at the Musee Mechanique in Fisherman's Wharf to one of the only remaining Octagon Houses still standing in SF. Click here for my entire list of hidden gems.